Authored by aacid on Jun 11 2018, 5:21 PM. and show the validation summary as popup in the page view. 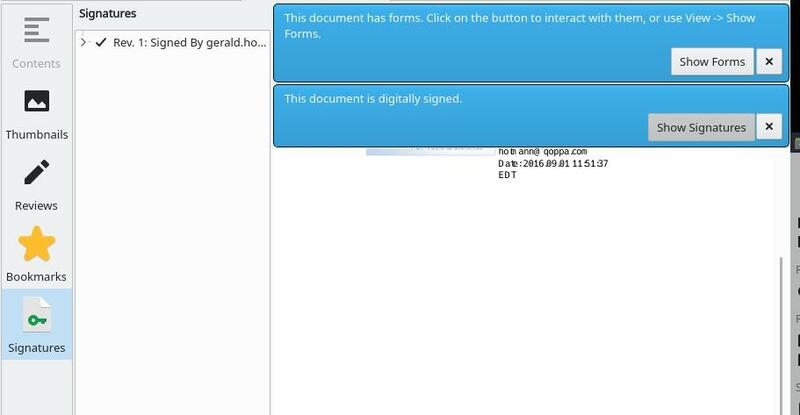 Open a signed PDF and click on "Validate All Signatures". I think atleast is not a word. Also does the user really care about this "you have a signature form", why are signature forrms more important than the rest? atleast is two words i think, also "has problem" is not correct either i think. I don't think this logic belongs here, it should be in document, this is not an "UI" thing, more a "core" thing. This document has forms of which atleast one is a signature form. I feel like an implementation detail is leaking out here. Even though internally the signature is just another form, from a user's perspective, the signature is something else. How about this? chinmoyr added a dependency: D14816: Add signature panel. show the signature panel widget and not the forms.